One of our values is serving others in the same way Christ served others. Learn more about our outreach opportunities here. Provide food for children who often spend the weekend without enough food through Buddy Packs. In lieu of Sunday worship, sponsor GO! Sunday on the Sunday after Easter when we go out into the community to serve. Doorways: A St. Louis agency that provides housing for people living with HIV/AIDS. Food Outreach: A St. Louis agency that provides food for people living with HIV/AIDS and cancer. Lydia's House: A St. Louis agency that provides long-term housing for women and children affected by domestic violence. Presbyterian Children's Services: A Missouri agency that provides support and help for children. Southside Day Nursery: A St. Louis agency that provides support for children living in sotuh St. Louis. Faithful Reform in Healthcare: A faith-based organization that envision a society where each person is afforded health, wholeness and human dignity. Missouri Foundation for Health: Develops and funds programs to meet healthcare needs in the region. Covenant Network of Presbyterians: Works for the full inclusion of GLBTQ persons in the life of the church. If you'd like more information about our Community Garden, please click on the applicable links below. In 2011 we kicked off the inaugural year of our community garden. Twenty-five plots were tilled and produced vegetables and flowers for the gardeners and the community. 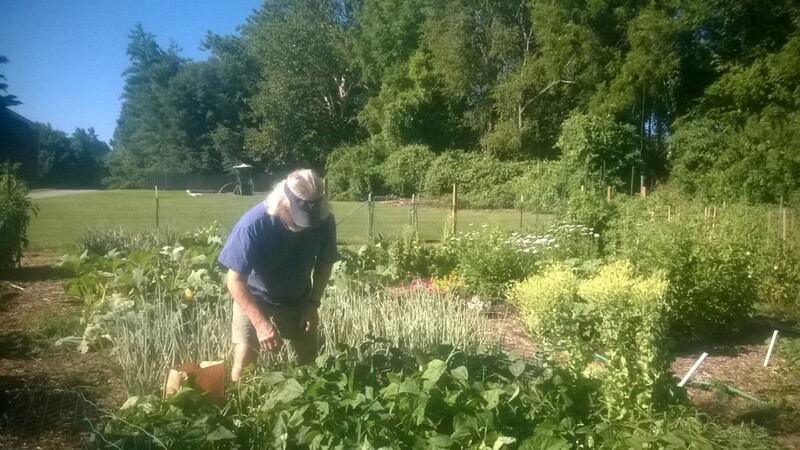 The "give away" garden produces beans, lettuce, tomatoes, squash and pumpkins for Circle of Concern Food Pantry. In 2016 we had another successful growing season! An irrigation system was put in and a fence keeps out the critters. Check with us in the spring for available plots by contacting Faith Des Peres Presbyterian Church at 314-432-8029 or e-mail Jim if you are interested. The cost for plots this year are $25/plot for the growing season. Many families struggle to eat healthy meals and snacks every day. The children in these families often go to school hungry in the morning and return home at the end of the day with little hope of having another hot meal until the next day at school. Even more disheartening, the availability of healthy meals and snacks over the weekend is frequently the exception rather than the rule. Buddy Packs is a community ministry program sponsored by Faith Des Peres Presbyterian Church intended to provide weekend meal assistance to children in a nearby school district. How Does Buddy Packs Work? The church works with schools to identify children whose families want to participate; or families may contact the school principal to learn if they qualify for the program. A parent or guardian is required to sign a permission form for a child to participate in Buddy Packs. If there is more than one child in a family, a separate permission form is required for each child. Every Friday afternoon throughout the school year, the church delivers a packs of nutritious food and snacks for the participating children to take home in their backpacks. The youngsters pick up the food in a designated, secure location. Participation in the program remains confidential, to the extent possible, to protect the children's privacy. There is no charge for a child to become a Buddy Pack participant; this is a free service sponsored by Faith Des Peres. What is in a Weekend Buddy Pack? Nutritious food for breakfasts, lunches, dinners and snacks for the weekend are provided. Hot or cold cereals, breakfast bars, macaroni and cheese, chicken or vegetable soup, canned vegetables, spaghettios, ravioli, apple sauce, fruit cups, pudding, pretzels, animal crackers, milk and juice are examples of the items in the weekend meal packs. Each pack is sufficient for one child for the weekend. Parents are asked if there is a microwave oven and a can opener in the home. They also are asked if their child has any food allergies. How Can I Help and Learn More? You may also contact the church office or the pastor for more information about Buddy Packs.